I have an excellent staff that is very experienced in working with kids. They are very professional and energetic, and excellent role models for all players. The size of the staff will depend upon camp enrollment with a ratio of approximately 10-1. It is @ 8-1 with younger age groups. Staff: (Standing, left to right) Indar Smith, Kristy Adcock, Ryan McOwen, Mark Roberts, Tom Ginocchio, Bjorn Nunan, Val Henderson. 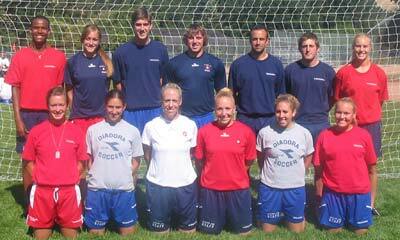 (Kneeling, left to right) Kelly Farrell, Lizzie Masland, Kelly Ginocchio, Stephanie Pearson, Rachel Resneck, Ryan Hedrick. 13th year on staff. Kelly played collegiately at UC San Diego where she won two NCAA National Championships. She teaches at Miramonte High School and is a Premier Level Soccer Coach with the Walnut Creek Soccer Club (WCSC). 7th year on staff. Josh played collegiately at St. Mary’s College and professionally in the US and Europe. He holds his NSCAA Premier license and is an Asst. Coach with Saint Mary’s College. He is also coached at Fresno State and is a Premier Level Coach. 12th year on staff. Jady played collegiately at St. Mary’s College. He has been a Premier Level Coach for WCSC, and teaches Physical Education at Valley View Middle School. Bradlee DeShane: 4th year. Current WCSC & Carondelet coach and former player at Fresno St.
Tito Gomez: 5th year. Current college player at NCU (Ore).Former WCSC player and currently playing collegiately at NCU. Nikki Rucki: 3rd year. Current college player at San Francisco State. Ari Whitmarsh: 5th year. Former WCSC player and currently attending University of Pacific.